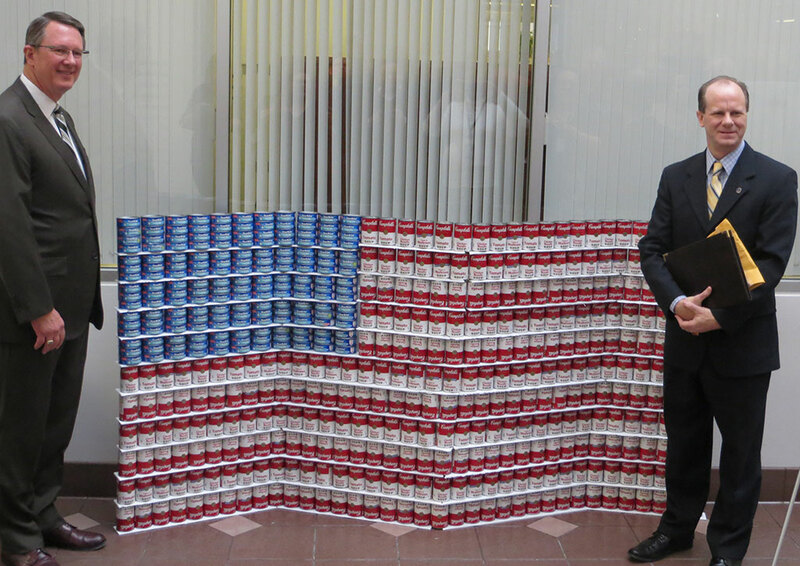 DART President/Executive Director Gary Thomas (left) poses with Union Gospel Mission Director of Development and Public Relations Jeff Steed in front of a canned food flag created by DART’s procurement department. DART employees collected 55,029 pounds of various food items this holiday season to benefit the Union Gospel Mission of Dallas. Completely supported by individual, business and church donations, Union Gospel Mission has been sheltering and serving homeless men and women in Dallas and its surrounding areas since 1949. In addition to providing meals and shelter, the Union Gospel Mission helps the homeless get back on their feet with educational resources, job training and more. “DART is part of the success stories we’re creating on a daily basis at the Union Gospel Mission,” said Jeff Steed, director of development and public relations for the Union Gospel Mission. DART has been partnering with the Union Gospel Mission for 19 years. In addition to the 28 tons of food, DART also presented a cash donation of $8,158. “There are things going on in this community we can impact,” said DART President/Executive Director Gary Thomas.